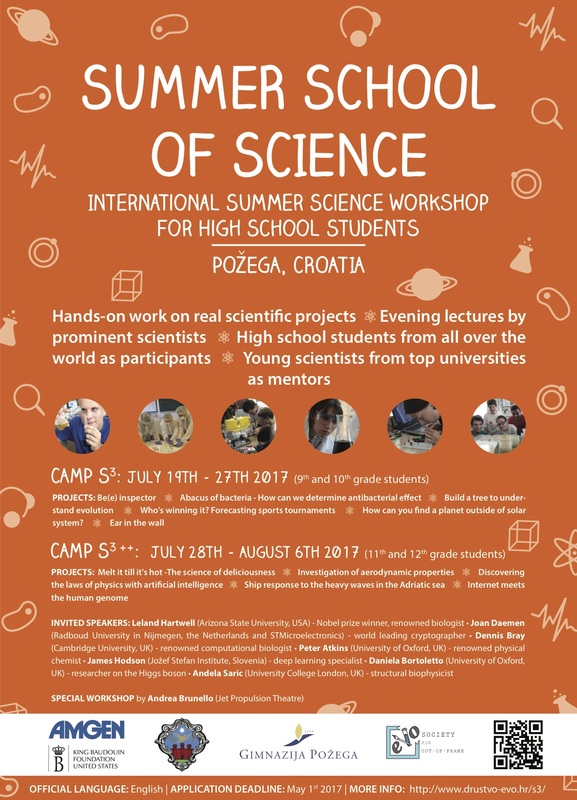 Fifth year in a row, a group of young scientists organises a Summer school of Science in Croatia. It is aimed at high-school students with strong interest in science where they get a hands-on experience working in small groups on a specific project. Participants learn and practice the scientific method and analysis, invaluable skills in their later careers. In addition to exploring science, these camps are an excellent opportunity to find inspiration and share the enthusiasm for discovery with like-minded individuals. Project work is accompanied by evening lectures from eminent scientists and workshops aimed to put science in a wider social context. One day is reserved for an excursion to explore the cultural and natural heritage of the region. In 2017 the participants will have a possibility to work aside young scientists from all over the Europe (Ireland, France, Belgium, Switzerland, Croatia etc). They are devoted to scientific and personal excellence as they teach through passion using a personalised approach to every student. In an open and informal atmosphere, students and their mentors work together, creating long-lasting relationships that not only help their individual careers, but also promote international and intercultural understanding. Our special guest in 2017 is the Nobel prize winner Leland Hartwell. S3++ for students who are completing the 11th or 12th grade (28th July – August 06th). Motivated students should consult the Internet page of the School http://www.drustvo-evo.hr/s3/ index.html for a complete list of projects and to download the application form. Applications are open until May 1st 2017.